Fuelstat Resinae Plus and Diesel Plus, Microbial Load Analysis Kits for Diesel and Aviation Fuels - Welcome to Oilybits U.K. There are a number of different types of micro-organisms that can grow in certain types of fuel. The biggest problem is presented by a lamentous fungus called Hormoconis Resinae (H Res). Previously called Cladosporium Resinae, and more commonly referred to as “Jet Fuel Fungus” or "Diesel Bug". H Res is a fungus that thrives in fuel. It requires only a minimal amount of water content in the fuel to grow and will cause filter blockages, contents gauging errors due to the fouling of sensors, and corrosion damage to tanks, pipework, pumps and meters if left unchecked. Bacteria and other types of fungi, particularly some yeasts can also cause problems in fuel tanks, usually acting as a consortium. The objective of the test is to provide rapid screening of fuel samples (water in fuel or fuel only), giving a quick and accurate assessment of H Res, bacteria & other fungi including yeasts in the fuel tank. This test is unlike current growth-based tests, which require a minimum of 72 hours to provide any results. The test measures the amount of active growth in the sample and provides actions and alert levels. 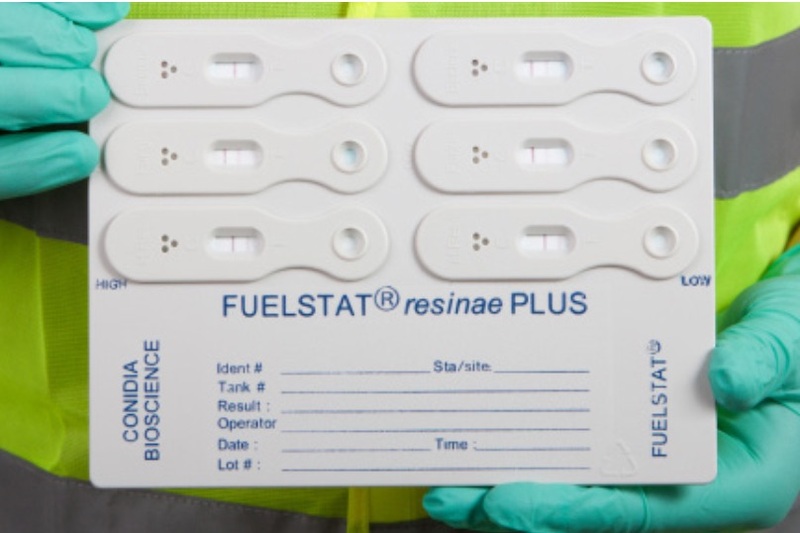 The FUELSTAT® Resinae PLUS and FUELSTAT® Diesel PLUS tests measure the amount of different types of contamination: H Res, bacteria and fungi actively growing in the sample and reports that as the weight of material in the sample. This is a newer, more accurate measurement system than the old Colony Forming Unit (CFU) count. Right side of paddle (LOW) 3 devices with cut off levels for H Res, bacteria and fungi at a level derived from IATA Guidance Material where the microbes have established themselves as a consortium and a fuel treatment is required. Left side of paddle (HIGH) 3 devices with cut off levels for H Res, bacteria and fungi at a level derived from IATA Guidance Material where the microbes are growing so rapidly, or have been growing for a long time that they may be causing damage to the structure of the tank or are likely to cause filter blockage and component failure and a tank clean and fuel treatment are required. Each heat sealed foil pouch contains a Paddle with desiccant sachet and pipette in one section and Sample Extraction Bottle with flat cap, dropper cap and instructions for use in the other section. Allowing fuel deliveries to settle in the tank for 24 hours before putting the tank back into service. Drain any accumulated water from the bottom of the tank weekly. Routinely test bottom samples for microbial contamination. Treat fuel if required, according to test results. Do not use after the stated expiry date, expiry date is 24 months from the date of manufacture, we aim to deliver with at least 12 months of the lifespan still intact. If longer is required please advise. ASTM D6469 – 14, Para 8.5, Standard Guide for Microbial Contamination in Fuels and Fuel Systems section states: Samples for Microbiological testing should be kept on ice for transport to the laboratory. Tests should be performed within 4 h and no later than 24 h after sampling. Samples stored at higher temperatures, or for longer times, can show the presence of microbial contamination that does not represent actual fuel system conditions. British Standards Institute BS 5410-3:2016, Testing of Fuel within Standby Generators Section 18.10 Fuel Filtration – Filters states: 1) There should be a fuel polishing system to help maintain the fuel quality, if there is no polishing system the fuel should be tested every three months. 2) Fuels for emergency generators should be tested every six months for quality and suitability. Since the introduction of Biodiesel (FAME) the quality and life expectancy of diesel fuels has been adversely affected. FAME is hydroscopic so a portion of the water in the fuel goes into suspension. This water can lead to injector pump damage and facilitate the growth of bacteria which blocks conventional filters. FUELSTAT® does not have any special handling, transportation, storage or disposal requirements.